Precision, quality and security are evident throughout the new Royal Mail building that has been constructed at their prestigious site in Llantrisant, South Wales. The Royal Mint is one of Britain’s oldest manufacturing businesses, whose pre-delivery stock is valued at hundreds of millions of pounds. It was therefore a great honour to manufacture and supply our BML200 system for the impressive entranceway to the new building, which has been christened the Royal Mint Experience. 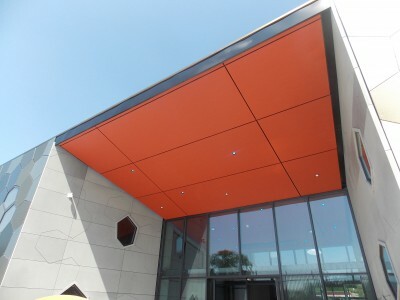 The main entrance certainly creates a vibrant, memorable impact for visitors and building users, employing a large, orange-coloured soffit featuring recessed LED spotlighting, which continues from the external entranceway through to the inside of the building, providing a smooth transition from entrance to foyer. BML 200 is a mechanically-fixed rainscreen system, which is suitable for wall cladding, soffit, fascia and column applications. It is a highly adaptable system, making it ideal for this prestigious project. The official name for the material finish is Rust Patina. This clever coating creates the illusion of texture on aluminium composite material (ACM). The material had to be perforated to create the space for small inset LED spotlights that suggest the glinting of newly minted coins, whilst larger lighting pods provide good illumination and help to produce a welcoming space. The attention to detail demanded by Rio Architects has been clearly fulfilled by cladding contractors Richard Kemble Contracts, evidenced by the precise installation of the clad elements. The new Royal Mint Experience building houses the main reception, ticket hall, exhibition, cinema, and cafe, bursts into life. Tessellating hexagonal aluminium panels pattern the walls of the building, designed to remind the visitor of random coins are finished in various shades of bronze, contrasting the very dark curtain walling and glazing framing. The Llantrisant Royal Mint site was opened in 1968 to cope with the huge production runs needed to prepare for decimalisation. Today it produces up to 90 million coins each week.